However, the dean ignored the truth: Sebelius promotes pro-abortion policies that turn the womb into the most dangerous place for unborn children to live in America. On May 18, as Georgetown University prepared to honor the chief architect of the Obamacare contraception mandate, TFP Student Action volunteers were kicking into gear for a prayerful protest at America’s oldest Catholic university. Shortly before 10:00 AM, we set up our campaign on the public sidewalk outside the Healy Gates, where we were joined by several other pro-life leaders and activists. Hoisting aloft the American flag, the TFP standard, and a banner reading: “Sebelius persecutes the Church, yet Georgetown welcomes her. 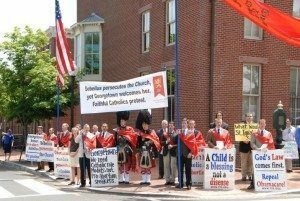 Faithful Catholics protest,” we braced for the expectedly polarized response of passers-by. We were not disappointed. 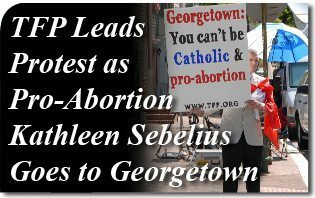 TFP Leads Protest of pro-abortion HHS Secretary Kathleen Sebelius at Georgetown University. In response to our sign reading, “Georgetown: You can’t be Catholic and pro-abortion,” one man proclaimed: “Why are you guys even here? Catholic is just a name!” Sadly, it seems that Georgetown would agree. In contrast with this attitude, the assembled pro-life supporters joined together in the recitation of the rosary in reparation for the grave scandal underway at Georgetown. The TFP protest was covered by several news outlets including CNN, Fox News and The Washington Post. After a campaign of several hours, complete with debates, interviews, and more importantly, the recitation of the rosary, we departed, ready to continue defending Catholic moral teaching in the ongoing battle for the soul of America. 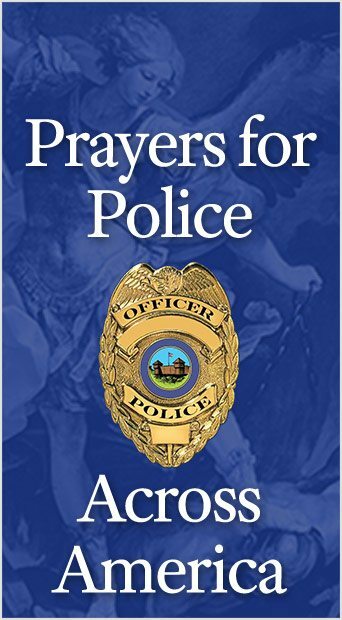 This entry was posted in Catholic Perspective, Events of 2012 and tagged abortion, America, Catholic, Church, Georgetown, healthcare, HHS, Kathleen, mandate, protest, Sebelius, TFP, truth, university by William Stover. Bookmark the permalink.